Republican presidential candidate Donald Trump speaks during a campaign stop at Alumisource, a metals recycling facility in Monessen, Pennsylvania, June 28, 2016. Republican presidential candidate Donald Trump on Tuesday used a speech in the Rust Belt state of Pennsylvania to attack rival Hillary Clinton's past positions on free trade agreements and to outline his own plan to create jobs. The billionaire businessman also railed against free trade deals, slammed China as a currency manipulator, and lamented the loss of U.S. manufacturing jobs in his speech, which he said was meant to "declare America's economic independence." Trump outlined a seven-step plan to bring back jobs to the U.S. The plan included withdrawing the U.S. from the Trans-Pacific Partnership (TPP) free trade deal, renegotiating the terms of the North American Free Trade Agreement, and appointing trade negotiators to identify trade violations by foreign countries. Trump also attacked Hillary Clinton for her past support of the TPP, a massive 12-country trade deal that would encompass 40 percent of the world's economy. The agreement would be a "death blow for American manufacturing," according to Trump. "(Clinton) praised or pushed the TPP on 45 separate occasions and even called it the 'gold standard,'" Trump said. During her time as secretary of state, Clinton enthusiastically supported the TPP, a top foreign policy objective for President Barack Obama's administration. But during her presidential campaign, Clinton has said she does not support the deal, saying the way in which it was negotiated does not meet her standards. The issue has been a tricky one for Clinton, who was forced to veer to the left by her Democratic rival, Vermont Senator Bernie Sanders, a Socialist who has vigorously opposed free trade deals. FILE - Los Angeles community members wait for Hillary Clinton's motorcade as they show their opposition to the Trans-Pacific Partnership in Beverly Hills, California, May 7, 2015. The TPP is a possible weak point for Clinton, who was a "very energetic supporter" of the free trade deal, according to Gary Hufbauer, a senior fellow at the Peterson Institute for International Economics in Washington, D.C.
"I understand the politics of changing her position, being hammered by Sanders and the left wing of the Democratic Party," Hufbauer told VOA. "But the way the negotiation came out cannot be very different from what she anticipated." If elected, Clinton may add a few "bells and whistles" to the TPP to protect American workers and satisfy many of her constituents on the left, Hufbauer said. "But it's a very difficult dance," he added. 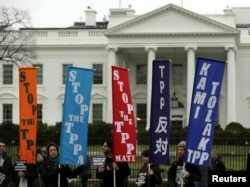 It is not clear how much the TPP will arise as an important issue in the election. Various polls have consistently shown that a large percentage of Americans do not even know about the free trade deal, which has not yet been ratified. The AFL-CIO, the largest federation of labor unions in the country, has already thrown its support behind Clinton. 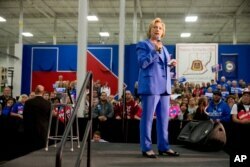 FILE - Democratic presidential candidate Hillary Clinton speaks at the Union of Carpenters and Millwrights Training Center during a campaign stop in Louisville, Kentucky, May 15, 2016. Tim Waters, the national political director at the United Steel Workers, told VOA his union will support Clinton over Trump. "It's not even a question," Waters said. "Clinton is head and shoulders above Donald Trump when it comes to issues that matter most to our members and our jobs," he said. "Anyone that would brag about using bankruptcies, which just devastated small businesses and workers, anyone who would brag about how he made money off that and gamed the system is not to be trusted." Asked whether he believes Clinton changed her stance on the TPP because of political expediency, Waters said: "I take her at her word. I absolutely believe her. "She might have been for the idea of a big Pacific Rim trade deal," he said. "But the devil's always in the details on these trade deals, and once it came out, she said ‘I can't support it.’"
Waters also accused Trump of hypocrisy in regard to China, saying the Republican presidential candidate only recently began railing against Beijing's economic policies. "Not one single time has he weighed in on and supported any of the fights we've had to have at the International Trade Commission or anywhere else when it came to China cheating or currency manipulation or any of the things he says he's so strongly against," Waters said. But on Tuesday, Trump took particular aim at China, mentioning the country 12 times in his speech. China has responded angrily to Trump's past comments and has suggested it will retaliate if Trump follows through on his promises of punitive measures. "If he were to do even half of what he has said he would do as president" with regards to trade policies, "he would essentially start a trade war. And if you start a trade war, everybody is a loser," he said. American Cafe July 5th: Politics as Usual?